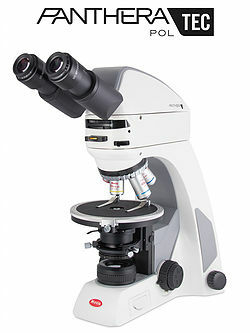 The Motic BA310 POL polarizing microscope is designed for the examination of birefringent samples from petrography and mineralogy, and can also be used for the synthetic materials industry where repeatable observations can be performed with efficiency and reliability. The BA310 POL also works especially well in educational settings or material professions, where affordability and ease-of-use are key requirements. 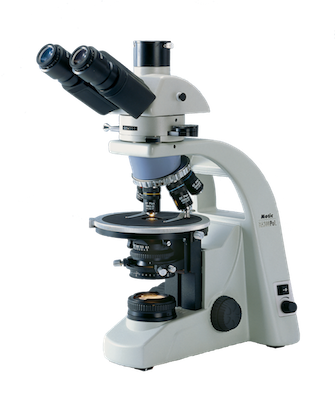 The BA310 POL is the perfect microscope for all geological samples. Optional reflected light illuminator allows operation with opaque samples. PantheraTEC POL Smart Microscope is a new generation of episcopic polarization microscopes combined with a Bertrand lens system. The 2 models feature Strain-free Optics and top grade Filters. The Bertrand lens system is both focusable and centerable. The pre-centered rotating stage with 160mm diameter has got a hard coated and chemical resistant surface; where a high precision ball-bearing mechanism ensures smooth rotation. Choose between a simple model with incident illumination, capable to perform polarization, and a more advanced model that can perform also brightfield, with incident and transmitted illumination. . . COMING SOON! Meyer Instruments, Inc., is an authorized Motic dealer-reseller.